May The May meeting of the Society met with Mrs Laura Morganiru the 8th of the month. 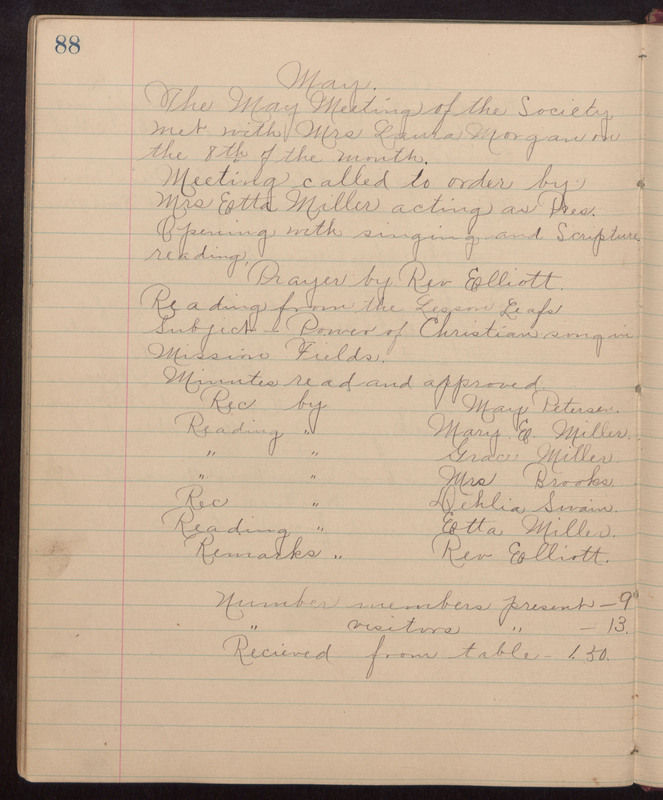 Meeting called to order by Mrs Etta Miller acting as Pres. Opening with singing and Scripture reading Prayers by Rev Elliott Reading from the Lessons Subject - Power of Christian song in Mission Fields Minutes read and approved Rec by Mary Peterson Reading by Mary E Miller Reading by Grace Miller Reading by Mrs Brookes Rec by Dehlia Swain Reading by Etta Miller Remarks by Rev Elliott Number members present - 9 Number visitors present - 13 Recieved from table - 1.50.